For a band as obsessed with the movies as Gnarls Barkley– they show up at award shows and public appearances dressed as characters from Napoleon Dynamite and Star Wars– it should come as no great surprise that their second album, The Odd Couple, is every bit a sequel to their breakout hit debut, St. Elsewhere, right down to the vintage TV-inspired title. But The Empire Strikes Back this is not; rather than enlarging the world of Gnarls Barkley and expanding on their already-impressive book of tricks, this is a sequel that pinpoints one element of their winning formula and mines it, offering an album’s worth of variation on a familiar theme. Some sequels are all about the broadening of horizons; this one’s about the narrowing of focus. In this case, that focus is on the unmistakable sonic imprint of “Crazy,” the duo’s blockbuster single from 2006. On that song, producer Danger Mouse and vocalist Cee-Lo Green stole a page out of Outkast’s playbook by funnelling hip-hop sensibilities through the sound of 1960’s soul and R&B. It’s that aesthetic that is at play throughout the thirteen songs on The Odd Couple; to their credit, Gnarls never even attempts anything like a “Crazy” rewrite, but it’s that same spooky, out-of-time vibe that permeates the feel and the tone of this entire record. But it wasn’t just the evocative mood that made “Crazy” a hit– no matter how effective Mouse’s old-meets-new production may be, it’s never going to be enough to rescue weak material, and that’s ultimately why The Odd Couple never matches the brilliance of Gnarls’ debut. They’ve fallen into the trap that movie buffs know all too well: They’ve tried so hard to capitalize on a winning formula that they’ve lost the heart and soul that made it winning in the first place. The Odd Couple is more about sound than song, so while the record sure sounds great, it’s neither as gripping nor as memorable as St. Elsewhere. But it’s not just the concentration on sound over song that bogs the album down; it’s also the fact that Mouse and Cee-Lo have forsaken the greatest virtue of their debut– their eclecticism. St. Elsewhere mined the vast junk heap of the MTV generation and built its own unique sound out of spare parts, combining pop and hip-hop, old and new, into an album that’s still funny, soulful, and full of twists and turns. The Odd Couple feels almost like it’s standing still when compared to the blur of its predecessor, offering minor variations on the same basic sound and mood, never straying far from a soulful, slightly spooky R&B sound. The futurism of St. Elsewhere is long gone, with the emphasis much more on Mouse’s 1960s fascination; gone also are the jokes, the genre-hopping, and the weird tangents. On the rare instance when the album does offer a St. Elsewhere-style diversion, like on the dark “Would Be Killer,” it’s not as inventive as tracks like “The Boogie Monster” or “Who Cares,” and it’s still cloaked in the same creepy haze as the rest of the record, so the songs sometimes run together. That also means that though the songs mine the same sense of dementia that made St. Elsewhere so deliciously creepy, it comes across as a little tedious. Songs about mental illness, suicide, and necrophilia made sense in the context of St. Elsewhere’s musical madness, but here the results are mixed; the loneliness and quiet desperation work well in the bluesier contexts of “Who’s Gonna Save My Soul” and the anthemic “Going On,” but the “I don’t have any friends” mantra of “So What” feels repetitious at best, downright whiny at worst. And since there’s not much humor here, nor very many songs that you can dance to, the album’s seriousness can feel stifling. 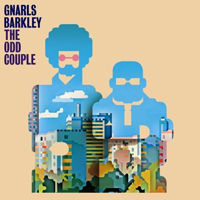 With all that said, it must be noted that even though the album isn’t as compelling or as rich as the one that came before it, it’s hardly a flop, because in its own way, it enhances our appreciation of Gnarls Barkley’s vision and their art. Their willingness not to phone it in with a clone of their first album, and their dedication to their craft in exploring the possibilities of a particular sound, incline one to think of this not as evidence that they’re one-hit-wonders, but, rather, as a necessary step in their evolution, a season of growing pains as they continue to hone in on what makes them so special. On their next album, they may strike a better balance and come up with a better set of songs, and, if nothing else, The Odd Couple affirms that even when they misfire, this group deserves our patience and our respect.